Is This Some Kind of Sick Joke??? I have a couple comments to make on this disturbing/disgusting venture. 1. If this religion is so great, why are 3 million people in the U.S. leaving each year??? 3. At the very least, churches could have picked a more positive, healthier, less corrupted institution. Not only that, but it will also directly support the heinous practice of factory farming. Now people will not only be getting brainwashed by a desperate religion, but they’ll be poisoning their bodies at the same time with un-foodlike ingredients, toxins, & GMO’s. And the poor children will get a double dose of indoctrination. Sad. 4. Hell, churches are pretty big. May as well throw in a Hooters, a sports bar, and a drive thru pharmacy. This is the kind of thing that makes Americans feel ashamed and embarrassed. “In the U.S. alone, 3 million people leave the church each year, and in 2103 as many as 10,000 churches closed down across the country. It’s time for churches to innovate. It’s time to pray different. The solution. To build McDonald’s in in churches. MsDonald’s restaurants serve 70 million people each day. They also bring communities together. 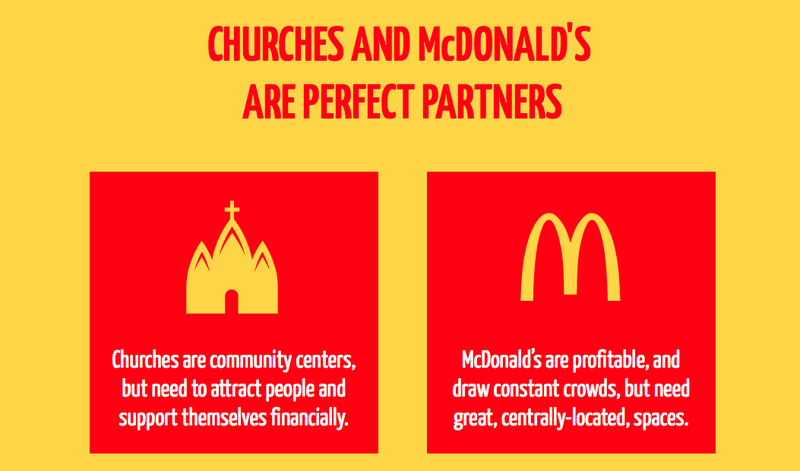 Churches and McDonald’s are perfect partners. Churches are community centers, but need to attract people and support themselves financially. 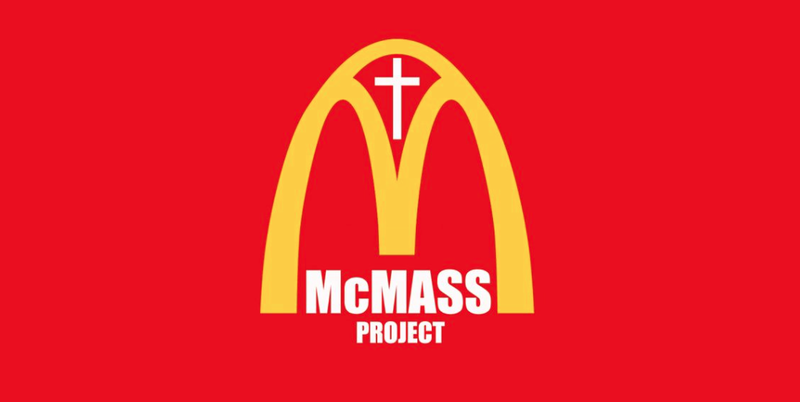 McDonald’s are profitable, and draw constant crowds, but need great, centrally-located spaces.